According to the 1983 hit single from Pat Benatar, love is a battlefield. In Roguemance, where every battle is a date, that’s not just a metaphor. In this game, you visit a tavern to pick up a companion, and then journey with them through some lightly randomized stages to fight monsters and get closer to each other. Your companions are randomized too, and they have different likes and dislikes, as well as personalities. If you’re traveling with two different companions, one may want to stop by the shop and buy a new move, while the other will want to go right into the next fight. Whichever option you choose will make that character like you more, and the other like you less. 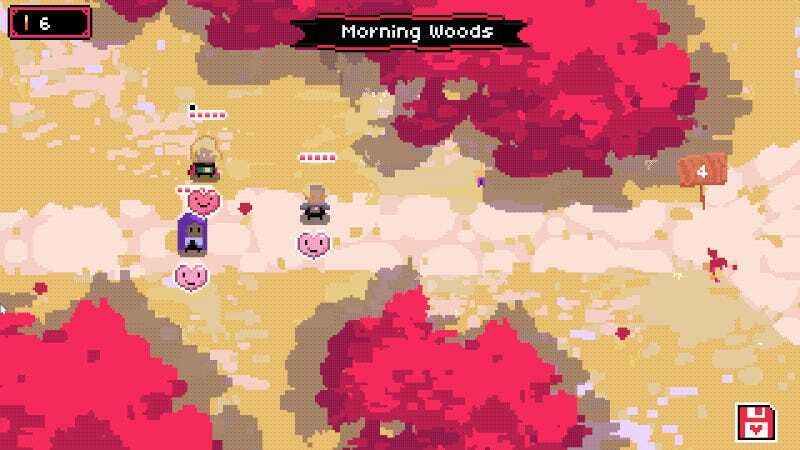 As suggested by the name, this game is a roguelike, meaning yes, your dates can die, and that death is permanent. You really gotta fight for your love. The battles themselves are the most fun, and a bit tricky. Every character has a rotating wheel of actions. 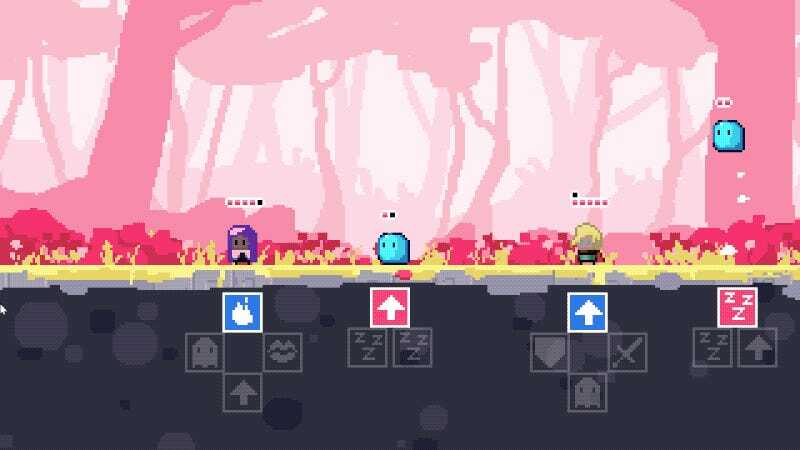 You can control your own actions, but the other characters will always perform their actions clockwise on their action wheel, although you can change the direction your companion is facing and thusly which direction their attacks are going. Trying to sync up the positions of the characters so they get hit by attacks is a nice puzzle. There’s also friendly fire, so you want to make sure your characters aren’t facing each other when attacking is next on their queue. After you get used to it, you can pull off some neat tricks. I always enjoyed blowing a kiss under a jumping enemy to heal my companion, or sending a fireball underneath them to hit a monster. It’s not an especially deep game, but it was interesting to see how quickly I got attached to characters with very shallow personalities, especially because they can fall in battle at any time. Lin, my first sidekick, was pretty chipper from the start. Whenever we fought monsters, even as we killed them, he’d say, “I love them!” Whenever I blew him a kiss, he’d reply, “The power of love!” He seemed like a nice guy, so when he died, I felt pretty bad about it. Ever unlucky in love, my next partner Rew, a goth mage with ice powers, died in his very first battle. Iny, on the other hand, was a complete bummer. He’d always say, “It’s hopeless” when we were fighting monsters, even if we were winning. Chill out man! Sure, we beat a boss together, but I’m eager to ditch him for someone more positive. 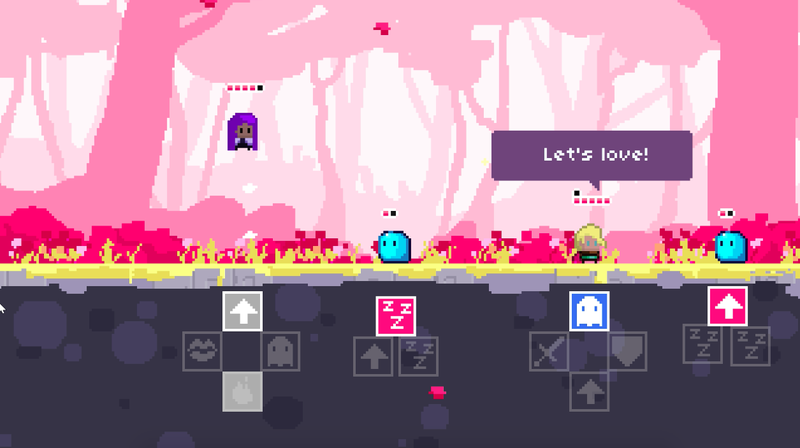 There’s not a lot under the surface with Roguemance, but I had a nice time with it. Even if your partners can die on your dates in this game, it’s less rough than real dating.